Join us from September through May, as the Department of Humanities in conjunction with the Drs. Kienle Center for Humanistic Medicine present a noon hour brown bag discussion of a humanities-related topic. The sessions are free, open to all, and no pre-registration is required. For more information about these programs contact the Humanities Department at (717) 531-8778 or email Claire de Boer at cdeboer@hmc.psu.edu. 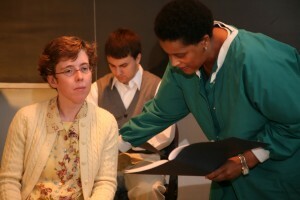 Beginning in September 2008, the Doctors Kienle Center for Humanistic Medicine has invited members of the student body, faculty, and medical center staff to participate in the presentation of one-act plays dealing with issues surrounding medical care and medical ethics. Since then a number of regularly scheduled staged readings followed by discussions with the cast and audience have taken place. Themes of previous presentations have been dementia, assisted suicide, the experience of cancer diagnosis and treatment of ethical dilemmas in organ transplantation. The Doctors Kienle Center for Humanistic Medicine invites all medical students, faculty and staff interested in participating in the continuation of a medical drama group to contact J.O. Ballard, M.D. at: jballard@hmc.psu.edu or call (717) 531-8778. Throughout the academic year students gather monthly to screen a movie that relates to their current curriculum. Discussions afterwards are conducted by faculty members from different student interest groups. Click here for a listing of upcoming movies. You can help us inspire future programs at Penn State Hershey by making a gift to support the Department of Humanities. Please visit GiveToPennStateHershey.org to make your charitable contribution or you can email givinginquiries@pennstatehealth.psu.edu to have a member of our development staff reach out to you to discuss giving opportunities. Benjamin H. Levi, M.D., Ph.D.
Jennifer B. McCormick, Ph.D., M.P.P. Kimberly R. Myers, M.A., Ph.D.